HIROSHIMA, Japan (AP) — Rescuers in southwestern Japan dug up more bodies Monday as they searched for dozens still missing after heavy rains caused severe flooding and left residents to return to their homes unsure where to start the cleanup. More than 100 people were confirmed dead in the disaster. “My wife could not climb up the stairs, and nobody else was around to help us out,” Katayama told national broadcaster NHK. His wife, who stayed behind and let her husband flee, was among more than 20 people who were found dead in the city, where a river dike collapsed. The assessment of casualties has been difficult because of the widespread area affected by the rainfall, flooding and landslides since late last week. 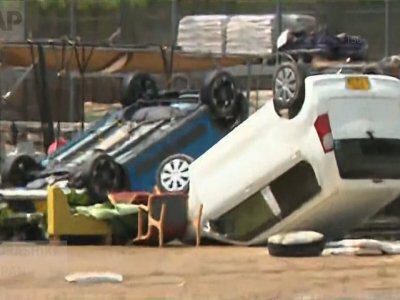 Authorities warned that landslides could strike even after the rain subsides. Officials in Ehime prefecture asked the central government to review a weather warning system, noting that rain warnings were issued after damage and casualties were already reported, a possible cause of the region’s extensive damage. Prime Minister Shinzo Abe canceled his planned July 11-18 trip to Europe and the Middle East to oversee the emergency response. Abe said earlier Monday that the government had dispatched 73,000 troops and emergency workers for the search and rescue effort. “The rescue teams are doing their utmost,” he said.